Fantastic post by man BAMF…Actually one of the best rundowns on Bond out there. I’m a fan of the literary Bond and really don’t care for the movie version. But I can stomach the Sean Connery Bond. Very good stuff. 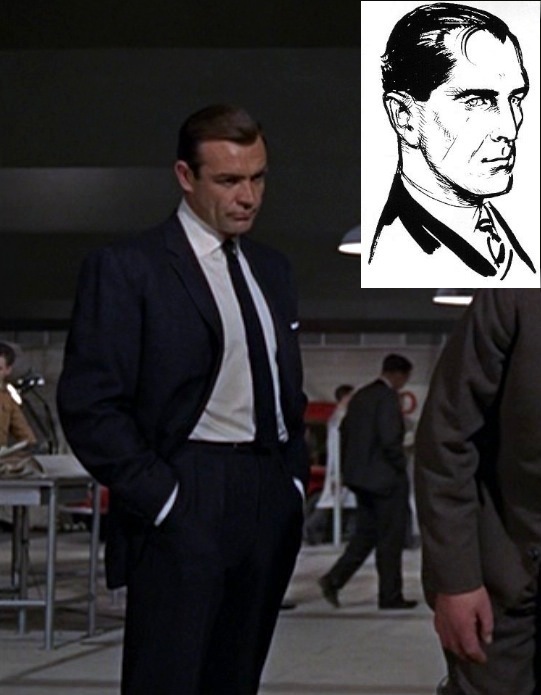 Sean Connery as James Bond in Goldfinger (1964), wearing the closest cinematic approximation of the suit imagined by Ian Fleming for his character. Inset is a drawing created by Fleming and commissioned for the Daily Express comic strip. 106 years ago, on May 28, 1908, Ian Lancaster Fleming was born in Mayfair to an eventual member of parliament and his wife. Throughout his life, Fleming would be a journalist, a Naval Intelligence officer, and – the role in which he is most remembered – the author who introduced the world to James Bond. After World War II, Fleming was demobilized from his position at British Naval Intelligence and began working as a newspaper manager, a job allowing him three months vacation. Fleming, whose ambition had long been to write a spy novel, used those winter months to retreat to Jamaica. This entry was posted in Bloggers, Film, Lit, Sartorial and tagged 007, Bond, book, Books, Clothing, Film, Ian Fleming, James Bond by Sir Edward Percival Fox-Ingleby, Bt. Bookmark the permalink.